- Injury report: For the Raptors, Kyle Lowry (sprained right ankle) is out. For the Thunder, Andre Roberson (left patellar tendon) is out. - Hello again: Friday’s game will be the second in a back-to-back set with the Thunder that began in Oklahoma City on Wednesday with a 123-114 overtime victory for the Raptors. Wednesday’s win gave Toronto its 21st victory against a Western Conference opponent, a new single-season franchise record. Toronto started its 21st starting lineup in Wednesday's game, after using just 12 starting lineups a season ago as the team continues to deal with injury woes as of late. - Recent history: This is the 29th time in franchise history that the Raptors have played the same opponent in consecutive games during the regular season. It last happened Dec. 21-23, 2017, against the Philadelphia 76ers. Toronto enters Friday’s game having won two straight while the Thunder are eager to get back in the winning column after dropping their last four games. 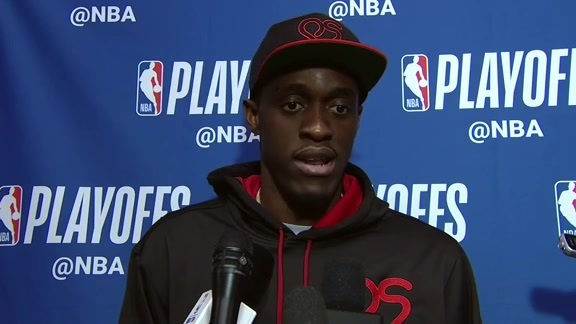 - Keeping it spicy: Pascal Siakam led the way in Toronto’s overtime victory in Oklahoma City, recording his 16th double-double of the season. He scored a team-high 33 points to go with 13 rebounds, six assists, two steals and a blocked shot in 43 minutes of action. It was an efficient night for Siakam as well, as he shot 14-for-21 from the floor. Siakam is averaging 16.6 points, 7.0 rebounds and 3.1 assists per game this season. - Double time: Kawhi Leonard joined Siakam in the double-double club, posting his 14th double-double of the season against the Thunder on Wednesday with 22 points and 10 rebounds. He also tied Siakam with six assists and two steals in 42 minutes. Leonard is averaging 27.0 points per contest, ranking him eighth in the league in scoring. He has topped the 30-point threshold 21 times this year and has led the Raptors in scoring 43 times this season, the most ever by a player in his first season with the Raptors. - Free throws: Though the Raptors shot 52 percent in Wednesday’s game compared to Oklahoma City’s 42 percent, they still couldn’t shake the Thunder late. With nine points from Paul George and eight from Russell Westbrook in the fourth, the Thunder outscored Toronto 32-18 in the final quarter to force overtime after trailing by 12 with four minutes remaining. Though Toronto would go on to outscore Oklahoma City 13-4 in the overtime session to take the victory, the free throw percentages for each team stand out in a game that went the distance. While the Raptors were excellent, shooting 19-for-21 (91 percent) from the line, the Thunder struggled, making just 15-of-29 (52 percent) of their free throws, well below their season average of 71 percent.